I have recently been introduced to the music of Casey Weston, a name fans of The Voice US may remember from her top 8 finish on the first season of the show. 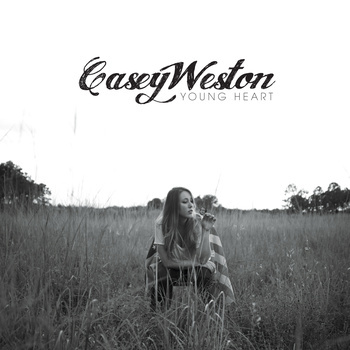 Casey released her latest full length album Young Heart in February 2015 and the fact that she has co-written every track on the album gives the release a sense of identity that serves to make it feel very personal to Casey and to draw listeners in at the same time. Whilst it is hard to pick a favourite song from this very impressive album, Never Come Back stood out for me. The track explores the deeper side of Casey's tone and she delivers a very emotive vocal performance. Relatively, the production doesn't change much during the track but it truely doesn't need to. The solid, almost soft rock feel to it works really well and slots in nicely between two more upbeat tracks. You can't fail to want to tap your feet along to Little Bit Of Everything. You can hear the gutsy attitude oozing from Casey's voice from the second she starts singing and the song as a whole seems to be one of those makes you want to turn it up loud and sing along. "Daddy's little shy girl, taking on the whole world" is one of my favourite lines from the whole album and the happy-go-lucky feel to the lyrics as a whole fits with the rest of the production and Casey's vocal delivery to create a great track. Definitely one that you could, quite happily, play again and again. Album closer Lock & Key is one of softest tracks from Young Heart with it's acoustic guitar orientated instrumentalisation and it also where Casey sounds at her most vulnerable vocally. She channels this vulnerability through lines like "the hole in my heart was healed with a look from you" and "our songs are the sweetest melody" and the other aspects of the track fold around her vocal to create a really touching end to a very strong album. The only song that felt at odds with the rest of the album is, in my opinion, Graveyard. Whilst there is no doubt that Casey delivers a strong vocal but the track as a whole just seems to stick out as not being as strong as the rest of the album. The production has a very minimal country influence compared to the other tracks, instead almost erring towards an electro-rock with an overall average sound that is unfortunately dwarfed by the rest of the album. In Young Heart Casey has released an album that blends rocky, upbeat tracks with softer, heartfelt numbers incredibly successfully which results in an overall album that provides very compelling listening. This is certainly an incredibly impressive album from a talented singer-songwriter, I would urge everybody to listen! Certainly an artist to keep an eye on. Labels: Casey Weston "Young Heart"
C2C 2016 pop-up artist details! The Bluebird Cafe at C2C 2016! C2C 2016 after-show party line-up announced! Ten favourite....artists to watch in 2016!